Trees and Shrubs add curb appeal! You have just moved into a brand new home! Congratulations! You decided to go with a brand new home that was just built! The only problem with your brand new home is when the builders built it, they tore down everything. There is barely even grass. It just makes the yard look sad. Never fear, Hutcheson Horticultural is here! The first step is deciding what you want specifically and where. Grass is pretty obvious, but as far as the rest of the things, you are lost. By browsing our online plant gallery, you can get a better idea of what your options are. We will examine two popular options: trees and shrubs. Trees are a fantastic option, especially if you currently have none. The U.S. Department of Agriculture claims a young, healthy tree can provide a net cooling effect equivalent to ten room-sized air conditioners operating for 20 hours a day! This is a great option if you live in Georgia! Decorative trees also add a ton of curb appeal! 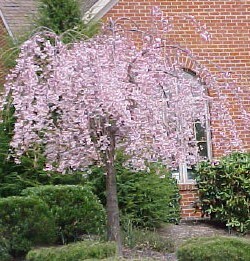 Try a weeping cherry or a crape myrtle! Shrubs are another great option to make your home not only looked “lived in”, but also add character! Not only does adding shrubbery improve the aesthetics of your home, but it also has energy saving and Eco-friendly benefits! It improves air quality, reduces air temperatures, helps when it rains, and provides privacy! Who knew a shrub could do all that? Happy planting! Also, do not forget to follow us on all of our social channels: Facebook, Twitter, and Google+!